membrane for operation of throttle slide. top chamber.) Top chamber must be air-tight. air-tight assembly. 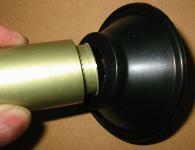 Some diaphragms may be attached by use of rivets. Slides are sold as an assembly ready to install. down, but communication hole and vacuum in top chamber equalizes this pull. 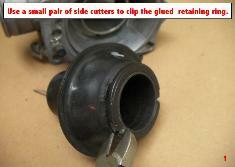 on an 80 mm diaphragm, would be about 7 pounds at only 1 psi differential. Just calculate the area of the diaphragm. Smaller diaphragms would have less force. glue" to the metal or plastic slide. Some diaphragms may have a "molded-in" metal plate attached to the slide by rivets. JBM uses TSR material that has a very limited amount of stretch. There is no fabric in the rubber to limit stretch. 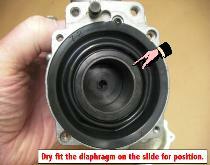 Stretch of the rubber diaphragm would allow the diaphragm to move without lifting the slide, so throttle will not fully open. Stretch of the rubber would also allow the easy rotation of the slide, as there is no key on the slide to prevent this. slides can be a bit heavy, yet must move quickly. never install in cold temperatures. this makes installation more difficult, as the diaphragm must first be aligned on the slide so the slide is facing correctly. For this reason diaphragms should be installed one at a time. Tire and diaphragm are chemically resistant, but it is rubber, and can be swollen by chemicals, solvents, and glues. 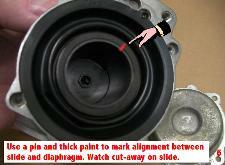 allow engine oil onto the diaphragm. 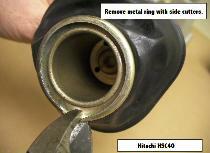 Synthetic oils could also ruin the diaphragm, so use mineral oil only. correctly, they will move very easily. Rolling the diaphragm also makes it much easier to install the top cover. shrinking or just age. 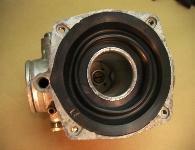 Drilling out the communication air hole is trying to cure the symptom, and not the problem. Please don't drill out the air holes. new does not require any glue in order to seal.